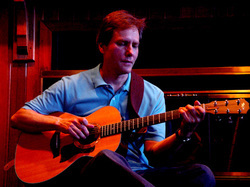 Bob Semanchik’s music is a unique blend of acoustic/vocal, electric blues, classic rock and jazz guitar. Bob has been a performing musician since the age of 15. He gigged his way through music school and ended up in the popular New Haven, CT, band “The Crayons” in the early 1980’s. The Crayons were one of CT’s most popular bands, playing a mix of originals and covers of the time. Over the past nine years, Bob has been a member of the Bales Gitlin Band, a band that has been working together for over 20 years. It was partly through the association with the Bales Gitlin Band and the fantastic jazz musicians featured in the band that Bob acquired a taste for jazz guitar and especially jazz chord melody guitar.